Not quite as good as the Thomas Keller recipe but very, very close. 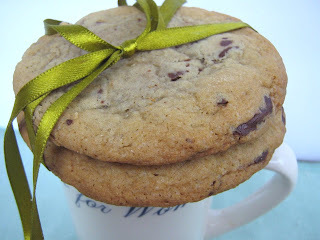 Chocolate chip cookie recipes cast a wide net and which one(s) you prefer really depends upon...well, you. I can't claim that one recipe is 'the best' because not everyone will agree. 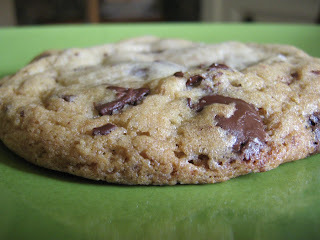 My personal ideal chocolate chip cookie is chewy, fat, and doughy. By doughy I mean that I like to taste the actual cookie and not be bombarded with chocolate. *Gasp*. I love my chocolate but if I want it I will make a double chocolate cookie or a brownie. 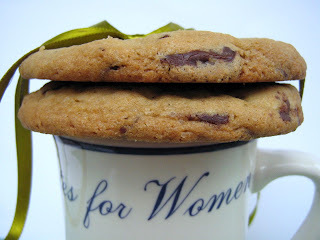 A chocolate chip cookie should be an equal marriage of cookie and chocolate. Some of my friends like mass quantities of chocolate in every bite, some like cakey cookies, while others prefer flat and crispy. It would be amusing to have a round table discussion about this during the Sunday morning political shows. Ok. I know. Lets get on with the actual cookie. These cookies met all my qualifications except for the thickness factor. They are thicker than the default Nestle Toll House recipe, and much more complex. But they are not as fat as Thomas Keller's. 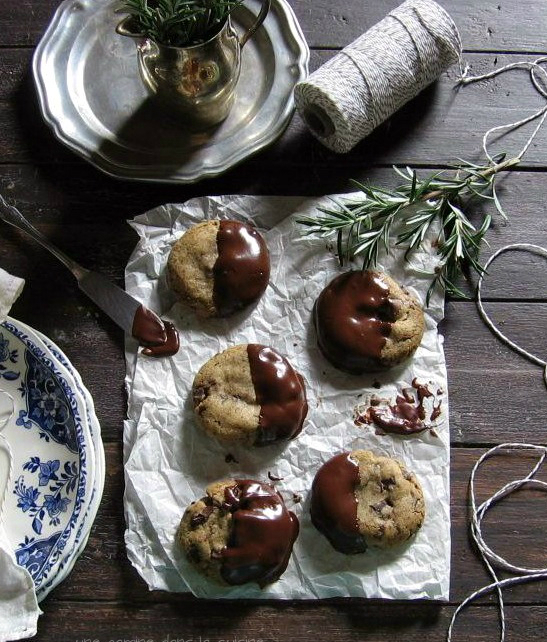 There are some recipes for these cookies that you bake immediately. The original calls for refrigerating the dough for about 36 hours. That is exactly what I did ( with great patience and an occasional wayward spoon ). Refrigerating the dough makes a huge difference, especially with this recipe. The first batch that went through the oven were the best because they had been cold for so long. Due to the humidity, the cookies became progressively thinner per batch despite the fact that I kept sticking the dough back in the refrigerator. However, this didn't affect the flavour. One of the things that I loved about the Thomas Keller recipe was the omission of vanilla extract. You tasted the real cookie. This recipe calls for a lot of vanilla, but it is not at all intrusive. These are very rich. I know that term is used loosely but when I say something is rich, I mean it in every sense of the word. The lengthy refrigeration time allows the sugars and vanilla to meld almost seductively into the flours and butter. They have a very slight spicy, caramel flavour with a dab of nuttiness. You would almost think that there was cinnamon added into the dough. The light sprinkling of sea salt makes these even more intriguing. Sea salt is one of my signature ingredients. I almost always add more than what a recipe calls for. I didn't have to with this one. Please don't skip this step. It really pulls out the dark chocolate and makes it even deeper. The salt and chocolate just play around on your tongue, It's amazing! In a medium sized bowl, sift together the flours, baking soda, baking powder and salt. Whisk together and set aside. In a large bowl, beat the butter and sugars together at medium speed for about 2-3 minutes or until the mixture is light and fluffy. Add the eggs, one at a time, beating well after each addition. Beat in the vanilla. On low speed, slowly add the dry ingredients and mix only until just combined ( about 8 seconds ). Carefully mix in the chopped chocolate by hand. Try not to over mix. Cover the dough in plastic or place in bowl with a tight fitting lid and refrigerate for 24-36 hours. I love chewy cookies too and yours looks delicious! I've made these, and what I don't like about them is that there are no nuts. I have to have nuts in my ccc. My fave is Levain's.But I put in vanilla cause they take it out too. I actually add coffee essence as well.Levains are so big they're like eating a scone. I lovethem big like that and love the textureof their ccc, crispy on edges, slightly underdone inside. & I agree with you, don't overpower mewith choc. I want some dough and nuts too. I love this recipe - sometimes I had espresso powder! Merci Isa! J'utilise l'espresso pour la prochaine recette!